Fabulous kit to get you started with wiring bonsai. Includes Step-by-Step bonsai wiring guide, 3 rolls of wire & wire cutters. Excellent value for money with free next working day delivery available. Step-by-Step Bonsai Wiring Guide by Lloyd Noall. 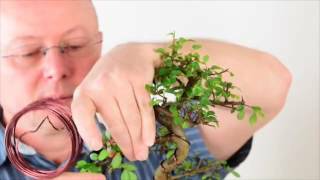 See our hands on video about how to wire a bonsai tree above. Wiring Bonsai Trees - Why do we wire bonsai?